One of the first and only Kpop Celeb to do so. I commend Jay Park for doing this because he’s one of the only Kpop/KHipHop celeds to mention let alone donate to any organization. In Honor of the people of Houston, we thank you for your generosity Jaebum. If you would like to donate, there are many of organzations to choose from. Don’t donate to the red cross and Femma. I guarantee the money will not get to the victims. Beyonce has a great one called “Beygood” and there’s one from a local youtuber I know. He’s Phil from the advise Show. He’ll make sure the money goes to the people. I’ll post some links below. Artist I predict will perform at KCON 2019! Is Z boys and Z girls a rip-off of Now United ? NCT 127 is having a North American tour! 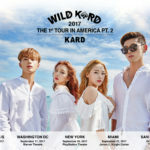 KNK is having a North American Tour!